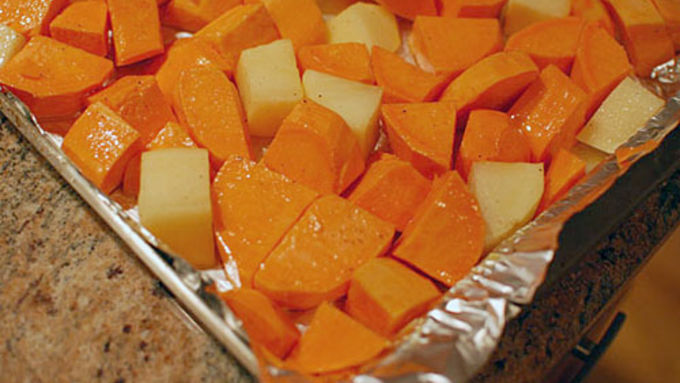 Get the potatoes in the oven first and let them roast at 350°F until tender. Meanwhile, let's start with the turkey layer. Brown the meat, then remove it from the pan. Cook the celery, onions, and carrots next. Add the 2 tablespoons butter, then whisk in the flour and let it cook for a few minutes, stirring constantly. Add the cooked meat back into the pan, then add the stock and bring to a boil. Lower the heat and simmer for about 10 minutes. When the potatoes are tender, mash them in a bowl with the half stick of butter and milk. Mix in the cinnamon and allspice. 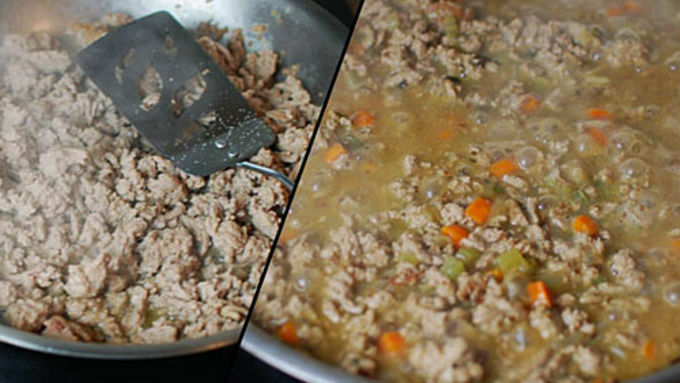 Add the turkey mixture to the bottom of a casserole dish. 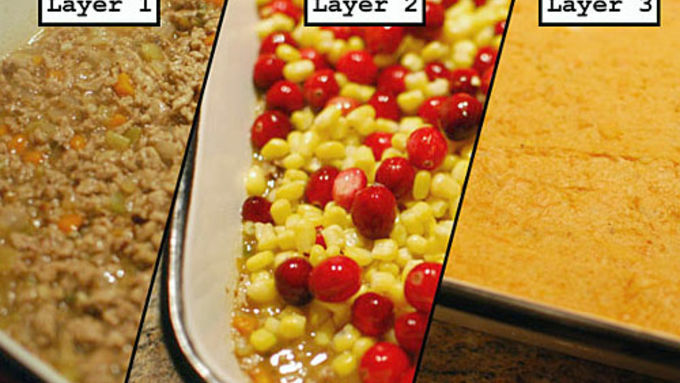 Next, mix together the corn and cranberries and add them on top of the turkey. 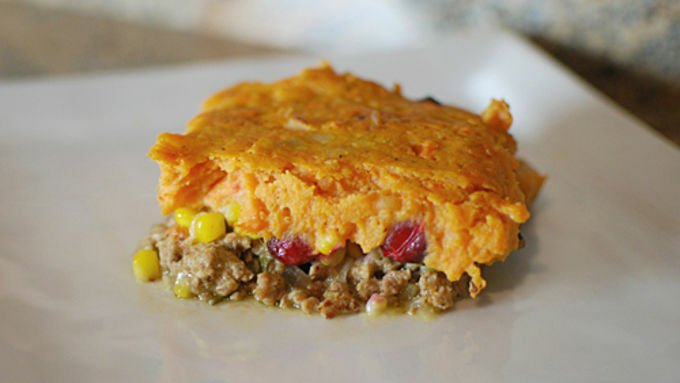 Finally, add the mashed sweet potatoes to the top and bake at 350°F for about a half hour. When things are getting bubbly and the top is starting to brown, pull it out of the oven. Allow to sit for 10 minutes before serving. Many people tell me how much they love a post-Thanksgiving casserole made from all the leftovers. I have personally never done this, but I understand why it would be delicious. What I don’t understand however, is: Why can you only have this once a year? These flavors are around all season! 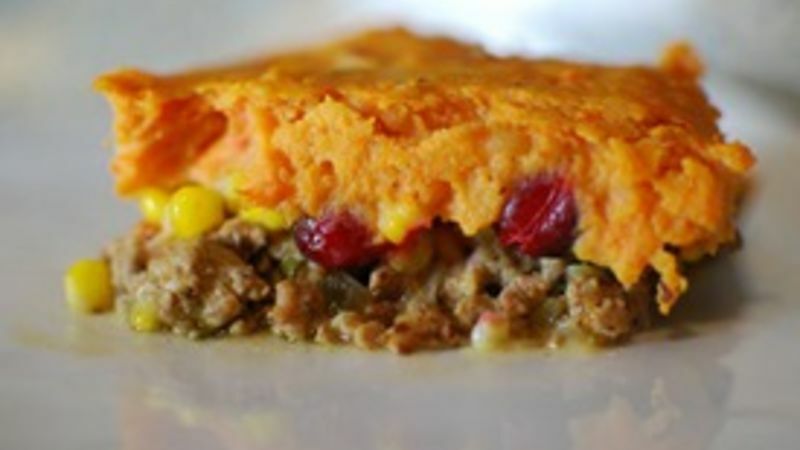 This twist on a shepherd's pie hits a lot of the Thanksgiving flavors and comes together in just about an hour. No turkey roasting needed! All my roommates loved this dish, and thought it was perfect for a chilly fall night. We had it on a Sunday and it really capped off the weekend and got everyone ready for the week ahead! More Shepherd's Pie Recipes We've got even more variations on this classic comfort food dish and they're all delicious.